It is very important to note that these tweets are done BEFORE the crash. It means they could not have been fabricated! @djp3tros Which proves that the #Buk really was in Donetsk that morning. @djp3tros Another interesting detail in that tweet is that “it was standing” and “they were waiting”. @djp3tros My understanding of that phrasing is that the #Buk was actually parked there for some time. Meaning there might be witnesses. Besides this non fabricated eye-witness report, we have a leaked phonecall from the driver to his commander. @djp3tros The SBU translation: “There, behind the ‘Motel’, outside Hornostaevka village”. That’s wrong transcription and wrong translation. 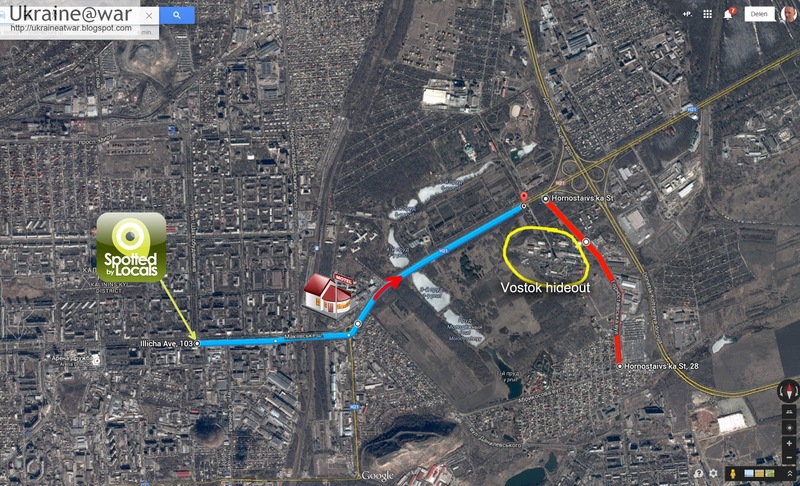 @djp3tros So the correct translation is: “past the motel [behind the motel], stopping before Hornostaevskaya”. @djp3tros Now, if you start from Shakhtobudivnykiv Blvd/Illicha Ave intersection and drive eastwards, there’s Hornostaivs'ka St right there! @djp3tros That means we should look for a motel along the Makiivs'ke Hwy. @djp3tros In the next call Khmuryi actually says: ‘behind the circle near Motel’. @djp3tros It was named after the bus station nearby (says the article). @djp3tros Summary: #Buk was waiting for some time at Shakhtobudivnykiv/Illicha (tweet), then moved to separatist checkpoint Motel (call). What Sergei probably did not know, but what I figured out in an earlier blog, is that Vostok batallion has it's residence in that area in an abandoned mine. It means 'motel' can also be a codename for 'the place where we stay'. The BUK is parked on a loader on the left side at the start of the route. The real motel is just at the corner. The red line is the street before which he has to stop. The yellow circle indicates the abandoned mine, which is Vostoks hideout. On the route to Pervomaiskoe the transport has been photographed and recorded several times, which confirms the authenticity of the phone calls. Because all the details fit and the eye-witness report could not have been fabricated, we can consider it CONFIRMED that the BUK was in Donetsk on the transport, even though we don't have photos from it. If you see errors or have additional info, please let me know.